CREATING a VISCERAL EXPERIENCE LIKE NO OTHER VEHICLE in SL . Full Compatible with Z-Tronic Scoreboard and N-Disc Combat System. + BATTLELOG Online ! Discover The BATTLELOG Online for Players Statistics, ARENAS MAP with Direct link SLURL and more..
– ULTRA Realistic Bike, 100% FULLY MESH +MATERIALS! in High Quality. – EXCLUSIVE FULL COMBAT SYSTEM! NO LAG! and very FUN! – FREE UPDATES FOR LIFE! – Change Camera View (three presets). – Display your Score when you play battle with scoreboard. – Activate/Deactivate and choose the colors of the Laser Trail. – This HUD stores position and size changes you make in the menu to suit your avatar. – You can customize the lights independently of wheels, lights, instrument panel and turbine, by choosing your color, glow and shine for each part. 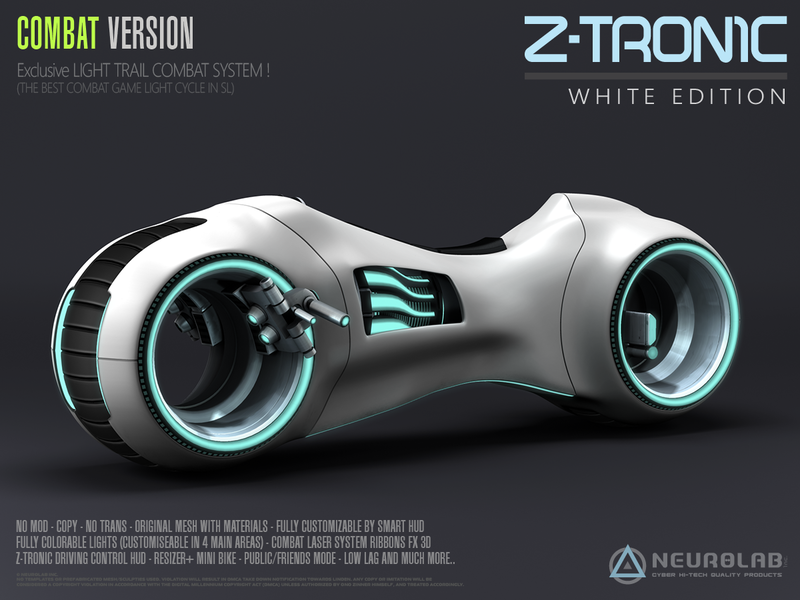 – Change the shine of the metal parts and bike body separately. – 16 Presets, Adjust texture animation speed. 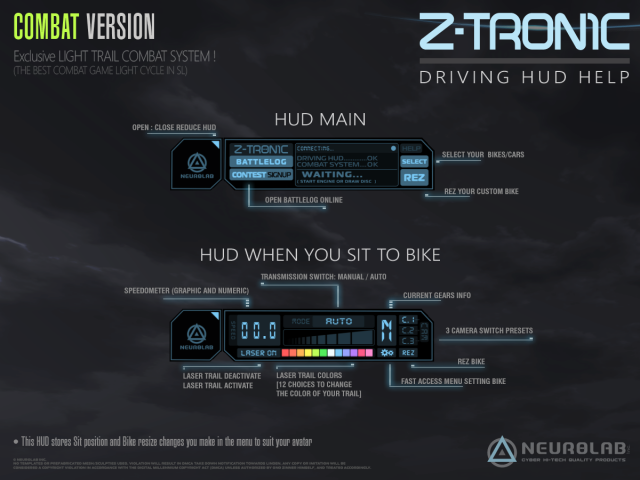 – Turn on/off lights and contours of wheels and much more..
Connect your Bike to the SMART.HUD with button [HUD custom] on your bike menu. change colors and others custom settings to your bike. unsit from the bike and Take Bike in inventory. Drop HUD Driving (Owner) to the ground, delete Bike under content, and drag your Bike custom. Take HUD in inventory, and wear. only one object in its content. [ Owner Only ] = When not allowing anyone else to ride the bike. [ SETTINGS] (V.6) New Advanced setting control for Engine ( Speed max, Acceleration, Steering ) with Point System ! – New Advanced setting control for Engine added ( Speed max, Acceleration, Steering ) with point system ! – New bike rebuild Mesh with Hard LOD quality resistant! – Physic improved! MORE responsive, more Faster for a better driving and fun!!! – Materials Ready+ Lights Projectors added. – Improved setting Drive animation and sit adjust. – NEW SMART HUD COMPARABILITIES. – Compatible with new Respawns Scoreboard 2.5 for Bike and Bike+Disc. – Beta NEW Laser System Close Test. – Added many news animations for rider and passenger. – NEW HUD Driving with many new features. – Many news to scripts! – Display speed to HUD for passengers. -Patch added to fix Havok Change from recent server update. -Other features added: Glowing exploded parts. – Encrypted message for combat. – removed auto die bike after owner leave bike more 5min to sim. but alway active when bike is for free use. – Combat MODE: Local Chat Message for all players in game to sim: who kill who? 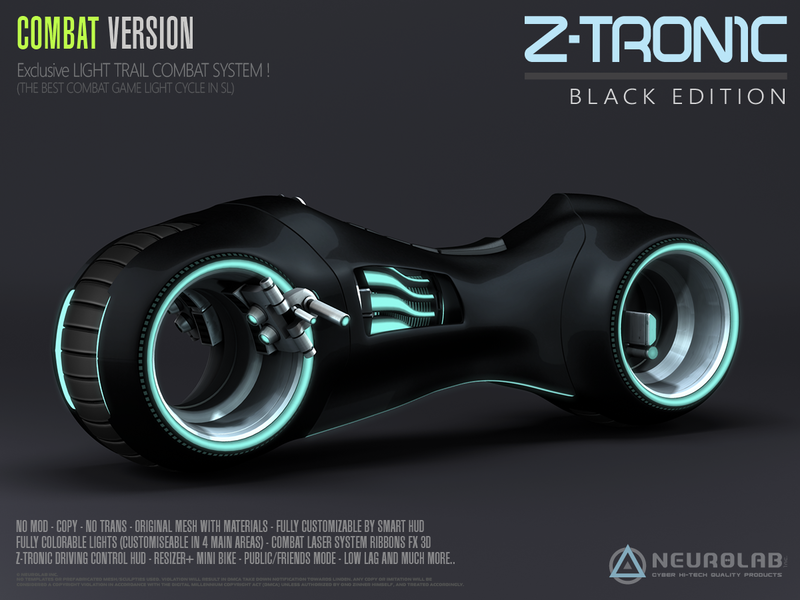 [05:59] [Neurolab Inc.] Z-Tronic – DRIVING HUD “Combat Version” 1.0 FP: OnO Zinner died in Rohacan Hirons’s laser ! – new particules texture for burn out. -MODE AUTO by Defaut on rez. -FIX to HUD driving for Switch Engine display.